Uber sound from the Uberkab. This 4x12" Bogner Uberkab straight cabinet features a black front speaker grill and a combination of Celestion V30 and G12T75 speakers wired at 16 ohms. This combination unleashes the brutality of the Uberschall amp, it helps to maximize the low end and give great cutting power to the mids/highs. 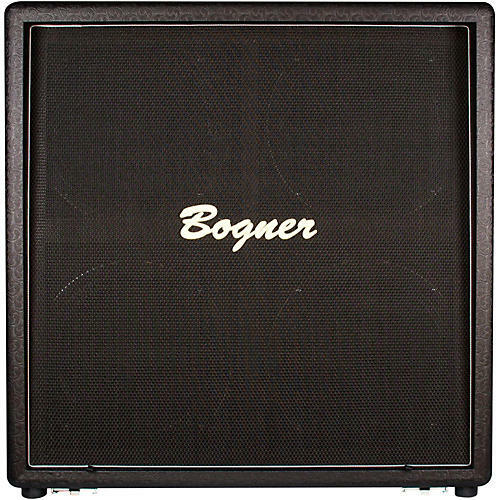 A standard Bogner 4x12" guitar speaker cabinet with V30's sounds great for the Uberschall as well, but Bogner wanted to offer a cabinet that was fine-tuned for the flame-throwing Uberschall and Twin Jet heads. Bogner's 210W Uberkab speaker and other 4x12 cabinets offer premiere 4x12 character: chunky bass response, with rich, fat, and woody tones. These speaker cabinets have been developed to respond to your nuances as a player. Bogner makes guitar speaker cabinets that are alive with resonance, 3D note projection and that dance with every note played.